Miami Wahoo Fishing heats up every year at the end of the summer and beginning of the fall. The best fishing comes about a week before the full moon in August, September and October. This year was no exception, and the Wahoo bite was is on! Capt. Manny has been on the Wahoo all week catching at least one Wahoo each day. Our largest fish this past week was an almost 6 foot fish weighing in at over 70 pounds. We had other fish in the forty pound range. 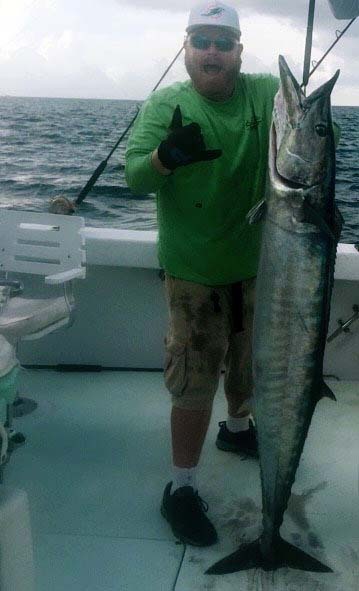 As well as a trip with a two fish double header of 20 pound Wahoo. We have found that off Miami and Miami Beach the “old school” tried and true rigs work best for us. Ballyhoo trolled in the long riggers are a long time favorite. Rigged with a small pink chugger in front of the bait has been a great producer this past week. We fish a ten foot number eight wire leader with a double strength 8/0 or 9/0 needle eye hook. The hook size is chosen depending on the bait size. We also use black and red, purple and black as well as blue and white chuggers, skirt & sea witch combinations. As well as many other styles of lures. With Islanders being another great choice. 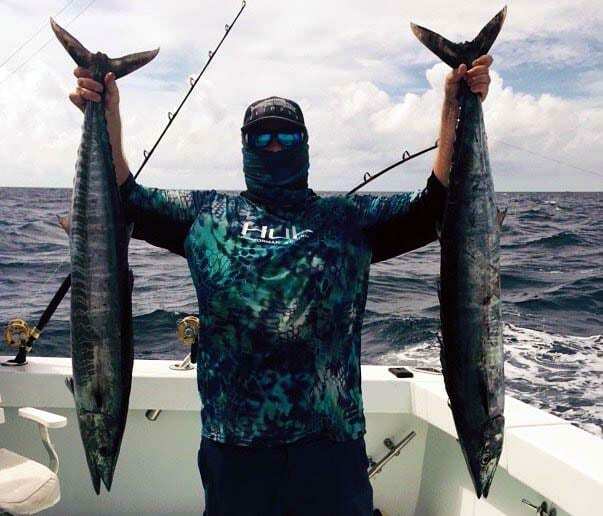 Getting your baits down deep is another effective way to target Wahoo while Miami wahoo fishing. We have found that inline number six and eight Old Salty planers work best. We fish eighty pound spectra line on the reel connected directly to a 500 pound barrel swivel. The most important trick I can share with you is to put a very large ball bearing swivel directly off the back of the planner. That swivel will keep your leader from spinning up into a tangled ball. Or worst of all, breaking off. We fish a long 45′ to 75′ leader made of 60 pound to 100 pound monofilament line. The best all around lure is the 3 1/2 Drone Spoon. My personal favorite is the chrome with blue tape. We also do very well fishing bonita strips and double hooked Ballyhoo. We add a combination of skirts and lures. This is done to enhance the action and color of the baits. As well as protecting the baits from wearing out.